New Taipei City, Taiwan, China. 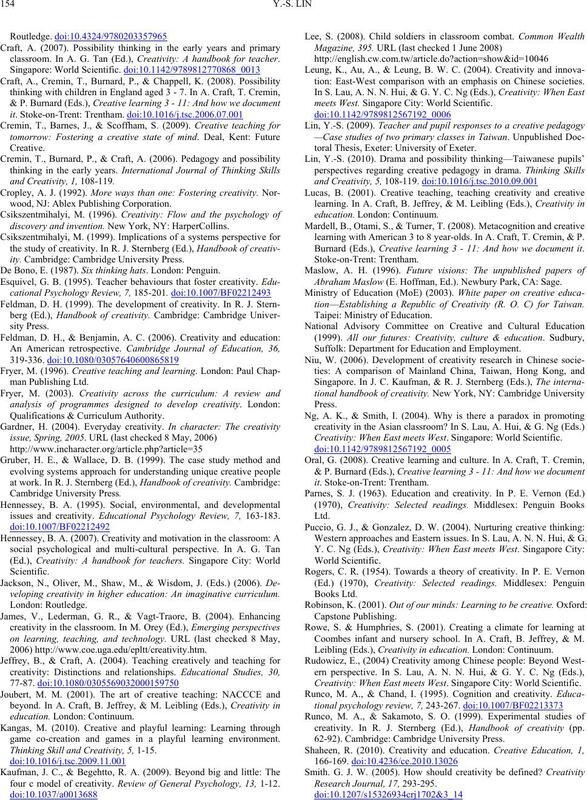 Received March 21st, 2011; revised May 10th, 2011; accepted May 24th, 2011.
end, several possible routes are suggested f or future research in creative pedagogy. efforts in extending and measuring individual’s creativity. learning one can extend the skills within those limitations”. culture (Fryer, 1996; Joubert, 2001). 2010). Many Asian countries have also responded to this trend. Lin, 2009; Ng & Smith, 2004; Rudowicz, 2004; Wu, 2004). are hence more relevant to educational values and settings. Feldman & Benjamin, 2006; NACCCE, 1999). 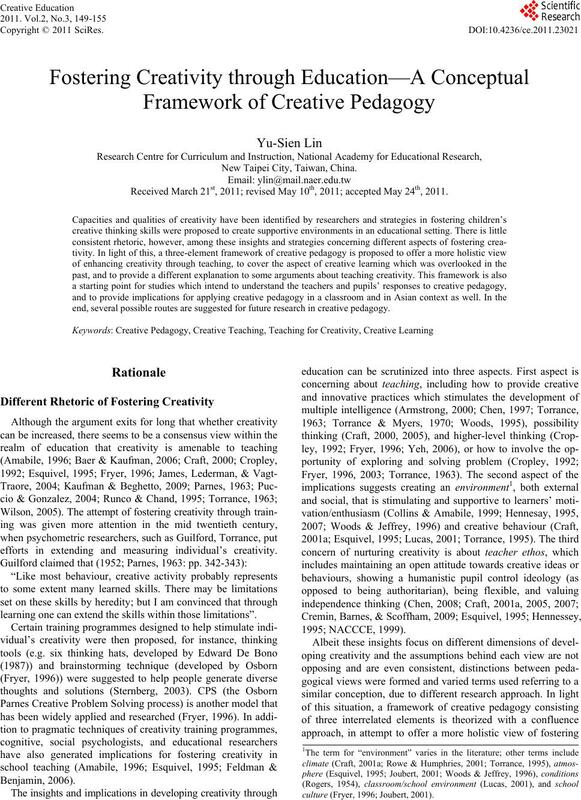 creativity in education occurred (Craft, 2001b; Shaheen, 2010). tial to be creative is unchanged. demonstrated in any subject at school or in any aspect of life”. in the learning process” (Kaufman & Beghetto, 2009: p. 3). posing ques tions, and pla y (Craft, 200 1a, 2001b). Conventional teaching and learning process (Lin, 2009). The three elements of creative pedagogy (Lin, 2009). cilitator), and creative learning (by the active learner). sion making and the responsibility for learning back to the child. a salient feature in the framework of creative pedagogy. searching, manipulating, experimenting, and even aimless play. for learning and thinking creatively. thinking and mini-c), which inform the proposed framework. close relations between each element are discussed as well. 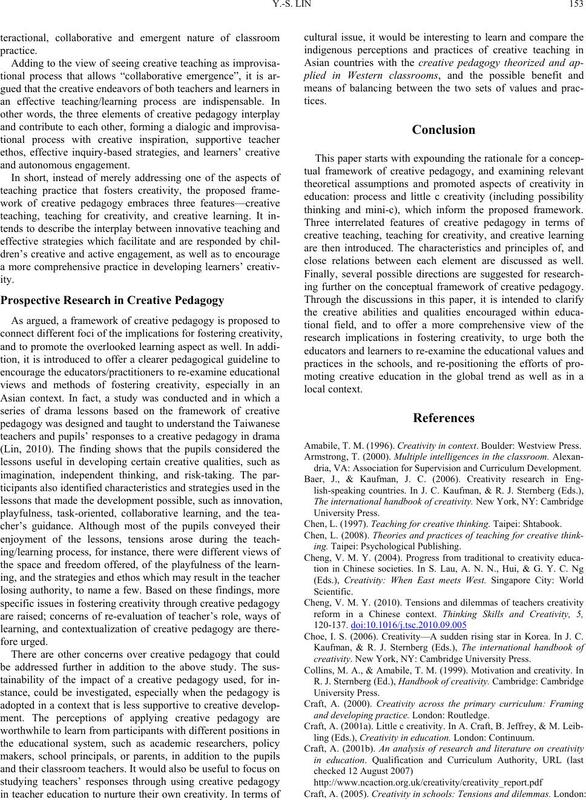 ing further on the conceptual framework of creative pedagogy. Amabile, T. M. (1996). Creativity in context. Boulder: Westview Press. dria, VA: Association for Supervision and Curriculum Development. Chen, L. (1997). Teaching for creative thinking. Taipei: Shtabook. ing. Taipei: Psychological Publishi ng. Choe, I. S. (2006). Creativity—A sudden rising star in Korea. In J. C.
creativity. New York, NY: Cambridge University Press. and developing practice. London: Routledge. ling (Eds. ), Creativity in education. London: Continuum. classroom. In A. G. Tan (Ed. ), Creativity: A handbook for teacher. wood, NJ: Ablex Publishing Corporation. discovery and invention. New York, NY: HarperCollins. ity. Cambridge: Cambridge University Press. De Bono, E. (1987). Si x thinking hats. London: Penguin. issues and creativity. 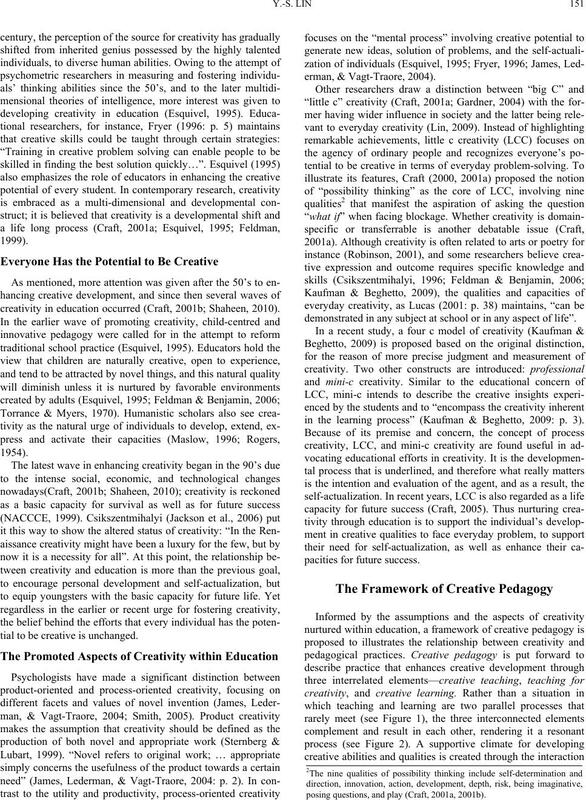 Educational Psychology Review, 7, 163-183.
veloping creativity in higher education: An imaginative curriculum. game co-creation and games in a playful learning environment. 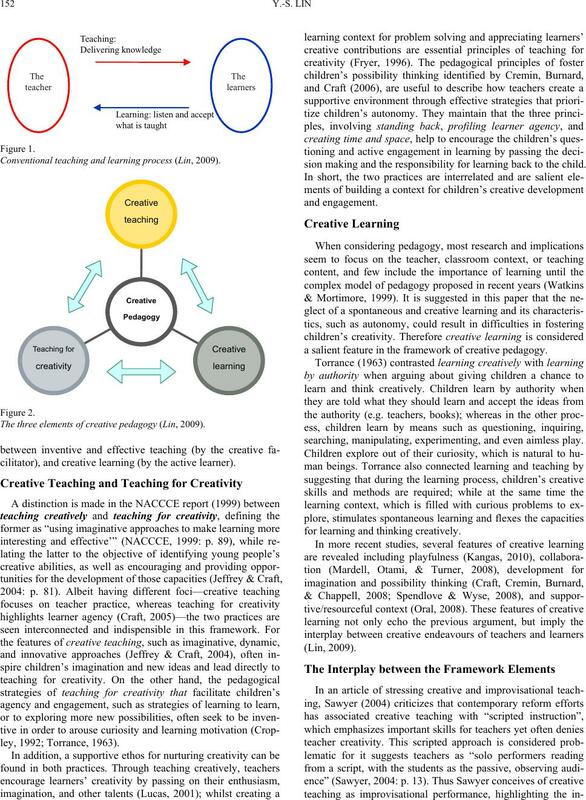 Thinking Skill and Creativity, 5, 1-15.
four c model of creativity. Review of General Psychology, 13, 1-12.
tion: East-West comparison with an emphasis on Chinese societies. meets West. Singapore City: World Scientific. toral Thesis, Exeter: University of Exeter. learning with American 3 to 8 year-olds. In A. Craft, T. Cremin, & P.
Burnard (Eds. ), Creative learning 3 - 11: And how we document it. Abraham Maslow (E. Hoffman, Ed.). Newbury Park, CA: Sage. tion—Establishing a Republic of Creativity (R. O. C) for Taiwan. Suffolk: Department for Education and Em ployment. Creativity: When East meets West. Singapore: World Scientific. Western approaches and Eastern issues. In S. Lau, A. N. N. Hui, & G.
Coombes infant and nursery school. In A. Craft, B. Jeffrey, & M.
Leibling (Eds. ), Creativity in education. London: Continuum. Creativity: When East meets West. Singapore City: World Scientific. creativity. In R. J. Sternberg (Ed. ), Handbook of creativity (pp. 62-92). Cambridge: Cambridge University Press. tivity. Cambridge: Cambridge University Press. bridge: Cambridge University Pr e s s.
learning 3 - 11: And how we d o cu me nt it. Stoke-on-Trent: Trentham. disciplined improvisation. Educational Researcher, 33, 12-20.
polis, MN: The University of Minnesota Press. Torrance, E. P., & Myers, R. E. (1970). Creative learning and teaching. New York, NY: Dodd, Mead & Company. NJ: Ablex Publishing Corporati o n .
learning. London: Paul Ch a pman. When East meets West. Singapore City: World Scientific. Yeh, Y. C. (2006). Creativity teaching—Past, present, and future.